We’ve been having a few warm, balmy nights lately. Coupled with the sun setting way into the evening hours, we had the perfect recipe for storytelling for grown-ups outdoors. Adventure & fitness community FlyCrew invited me to be part of their summer launch by telling a few Caribbean folktales. We set up outside of the Pavilion, North Middlesex Cricket Club in Crouch End. We created an intimate story circle and after a few introductions, I told the tale of Anansi and the Unknown Assignment. My version of this tale for grown-ups is a little bit chilling with the potential for Anansi to end up on the dark side of the character ‘Death’ after stealing his treasured ‘staff’. Being outside under the stars helped create a slightly spooky, sinister atmosphere! 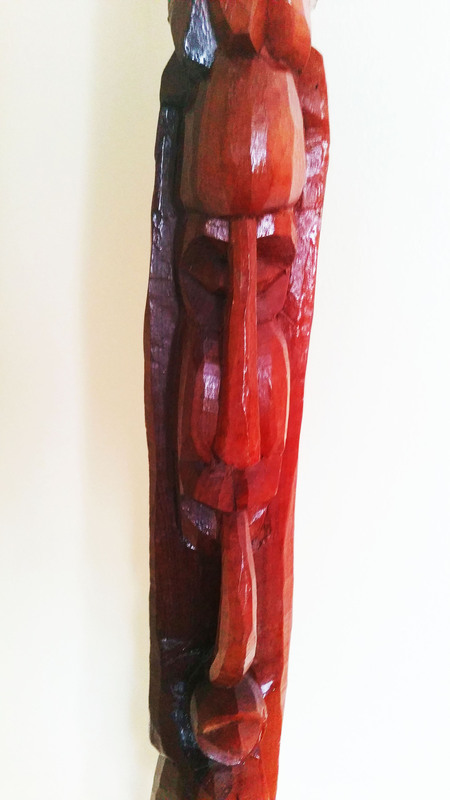 Bajan, wooden carved staff used during storytelling. For me, chatting between stories was just as much fun as telling the tales themselves. One lady shared that she was hoping to remember the tale I told so that she could re-tell it to her 8 year old son. That was such a joy to hear. Another lady shared a memory of her mother passing down folktales and I was able to recall my own memories of this. Both my Grandmother and Mother told me Caribbean folktales they’d heard in Guyanese villages and towns growing up. Passing down folktales in the local community is a wonderful thing to be part of. In this way, I get to share cultural traditions and spark imagination through the power of oral storytelling.